At £120, you're getting many of the basics - eight-channel audio with an optical output, decent-size VRM heatsinks, RGB LED headers, and enough fan headers to power up to six fans including one dedicated for AIO liquid-cooler pumps. It's fairly low-key as far as lighting and aesthetics go, and unlike its more expensive siblings there's no I/O port cover either. The low price does see cutbacks in other areas, though. The onboard audio has been reigned in to ALC892, although thankfully you do still get the usual six audio outputs instead of three as we've seen on some cheaper boards. There's also no support for USB 3.1 Type-C either on the rear panel or via an internal header, with just a pair of Type-A ports dishing out USB 3.1 speeds at the back. 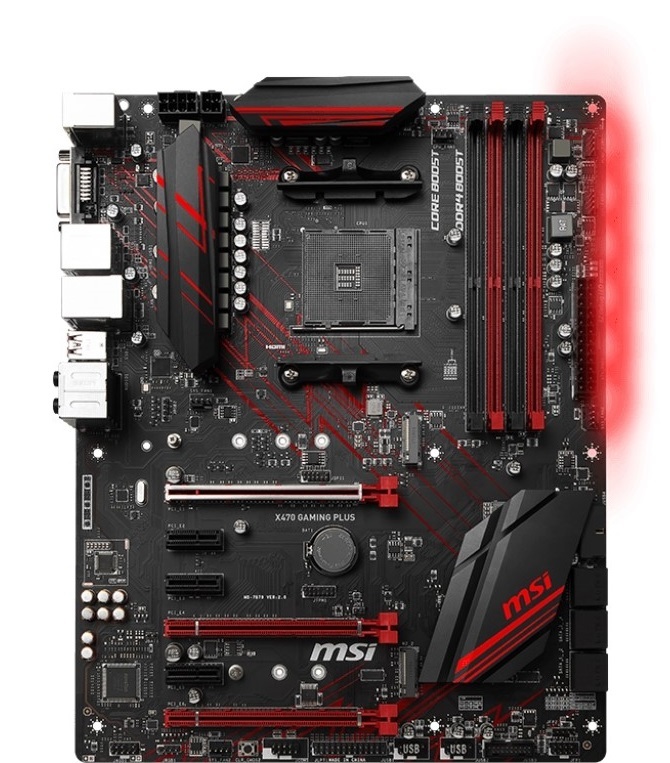 Surprisingly, though, MSI has managed to cram in an 11-phase power design, and there's even a CMOS clear switch at the base of the board, which is arguably one of the more useful overclocking and testing tools, especially if you're pushing the limits of memory speed and overclocking on AMD motherboards. We're not too keen on the textured finish on the heatsinks, though, as this picks up dust and marks very readily, and thermal paste is nearly impossible to remove without using gallons of paste cleaner. The lack of M.2 heatsinks isn't surprising, but you do get two M.2 ports, and these are sensibly arranged so that the top port supports PCIe 3.0 x4 SSDs, while the lower slot offers support for SATA-based models but is limited to PCIe 2.0, so you definitely don't want to use that port for your PCIe SSD. The top slot is located above the graphics card but is sandwiched between the CPU socket, DIMM slots, and primary PCIe slot, although this shouldn't matter too much. The six SATA 6Gbps ports are fairly typical of boards in the £100-£200 price range and also matches the Gigabyte X470 Aorus Ultra Gaming. However, even a glance will tell you that Gigabyte's budget X470 board offers some stiff competition for MSI. It costs around £10 more, but you get an I/O port cover, M.2 heatsink, more fan headers, and a USB 3.1 Type-C header as well as a Type-C port on the I/O panel too. With eight Type-A ports in total, admittedly one less than the Gigabyte board, the board is fairly well-equipped, though, and both boards obviously lack Wi-Fi too. The final trump card the Gigabyte board holds, though, is that it has an Intel-powered LAN port, whereas the one above is Realtek-based, although the differences these days between the two are extremely small.